We’re always a fan of women supporting women, and this year we’re marking International Women’s Day by introducing two brilliant BSc Human Geography graduates. Heather Cadden graduated in 2015 and mentored Amelia Harper, who graduated in 2018; both are now working in in Corporate Social Responsibility/Ethics. Find out more about where they are now, what they do, why it matters – and how they’re paying it forward to current students. Heather Cadden works in ethical business/CSR at Marks & Spencer. “I remember being so inspired when I was young when we did a project on Fairtrade. We all had to bring a Fairtrade product in – this was about 2000/2001 so it was mainly bananas, chocolate and coffee – and we then spent the show and tell being told all about the experiences of people in global supply chains and that initially caught my attention. Fast forward to my time at Reading and I did two modules on development in second and third year, which studied life in the global south, considered child labour and the ILO conventions. We did a project presenting as H&M and our stance on child labour in the supply chain, which was such an eye opener to the world of CSR and what a career path might look like. “All my roles have had the rights of workers in supply chains as our focus, which means that every area we work on impacts women in many different ways. In my current role we work closely with our suppliers to monitor their ethical standards but also encourage them to share best practice together and support each other if they have any issues. From the events we run to the day to day reports we grade, all the elements of work are to ensure we’re improving the experiences of workers in supply chains and by doing that we impact the women who work in those chains. We also work closely with other retailers to ensure we are working to similar goals and supporting workers. “Since graduating I’ve stayed in close contact with my lecturer Dr Sally Lloyd-Evans, and she’s been my referee. As I kept in contact when changing jobs we got to speaking about me coming into a lecture and chatting about my job. The first year I felt really underqualified so I offered to mentor a student instead. So from October 2017 I’ve been mentoring Amelia who was a final year student and now works in the CSR team at New Look. So this academic year we thought it would be great for us both to come back to Reading, talk about our jobs, the different ways companies approach CSR & Ethical and also how our mentoring relationship worked. Amelia Harper works in Corporate Social Responsibility/Ethics at New Look. 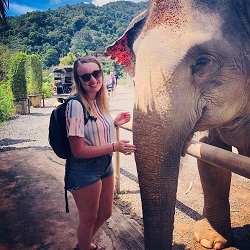 “Throughout my studies I didn’t know exactly what I wanted to do after graduation, but I always knew I wanted it to be centred around sustainability or helping people. My interest in sustainability developed at quite a young age – I remember that in year 7 I was on the green council and would spend my break times talking to the headmistress about recycling bins! “In one of our lectures Sally mentioned that she knew a Reading graduate that now worked at M&S in the ethical trade department, so I asked to meet her. I met with Heather and I asked her what she did day to day and how she got into ethical trade. After our coffee, Heather would check how I was getting on and send me any job roles/work experience that she felt I would be interested in; I eventually landed work experience at New Look in their CSR department soon after graduation. “I’m fortunate that I have been involved with both ethical trade and sustainability aspects of CSR. Most recently my role has focused on the sustainability side of the business, which has involved looking for more sustainable alternatives for our most used materials such as cotton, polyester and viscose. I have spent time engaging with the product teams to educate them on the positive impacts of these alternatives and encouraging them to increase their uptake of more sustainable alternatives in their products. “In the talk Heather and I recently gave to students, I discussed all the projects that we work on at New Look and what a normal day would be like for me. I think it was interesting for students to see the differences between my job in fashion, more sustainability-based, to Heather’s role in food, more ethical trade based – it highlighted that there is not a one size fits all approach to CSR, each corporation takes a slightly different angle. I also talked about how I got into CSR and what students could do to improve their CVs for a CSR job. After giving the talk at Reading, I connected with students on LinkedIn so that I could forward job roles/ work experience to them and make sure I was available for students to ask me any questions they may have. Heather and I are hoping to return to Reading in the future to give lectures to more students to help them understand the realities of the industry and give advice on how to get into it. Or at least, raise awareness of the industry and encourage people to make more sustainable and ethical decisions in everyday life. Congratulations to Chris Moorin, winner of the 2014 British Society of Soil Science MSc Dissertation Prize! 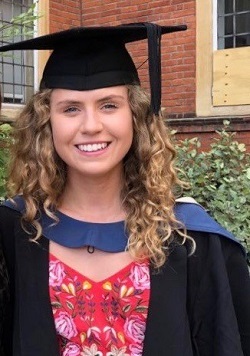 Chris’ dissertation was on ‘the impact of different organic amendments on potentially toxic element (PTE) bioavailability in soils and the possible evolutionary adaptation of Common Bentgrass (Agrostis capillaris L.) to high PTE concentrations’, supervised by Dr Denise Lambkin. The Award was presented at the 2014 Winter Graduation ceremony by Dr Joanna Clark. Excellent work, Chris! Very well done to all our students for their excellent dissertation projects. Class of 2013: where are you now? Class of 2013: where are you now? We would love to know about what you have been doing since you graduated! Visit here before 7th March 2014 to tell us more.